September 17. Today, a look under the hood of my fiction writing. A year ago I posted what I thought was a final version of my novel, but then I wrote a sequel, and now I'm doing deep rewriting of book one. It started this summer when I decided to write an alternate version that's more readable, and I still have a long way to go on that project, but it's already feeding back to improve the main version. This is a sentence from chapter six, drafted in February of 2017: "Torisa, still cogmodded, fumbled the handflight upface as the Captain raged through hyperacute stimslash." When that came out of me, it was so much crazier than anything I'd written before, that I almost jumped off the couch. "What if I could write like that all the time?" But looking back, the sentence is flawed. In terms of exposition, it introduces too much stuff too fast. And in terms of lyricism, "fumbled the handflight upface" tickles the tongue, but then "hyperacute stimslash" gets the mouth in a car crash. And that prefix, "hyper", is just a pretentious way of saying "very", which is already usually a mistake. If you're wondering what the sentence means, here it is all clunky and literal: "Still mentally altered by psychedelic drugs, Torisa fumbled to raise the controls from the floor, with which the Captain could fly the ship by hand, while he felt the pain of the sudden cancellation of his own drug effects." A recent attempt to write it better: "Torisa, still cogmodded, stumbled to shove her mattress into the ship's nose, pulled the fingergrip edges of a floorpanel, and raised the handflight upface, all as the Captain raged through sped head-reset." Now, here's what I came up with trying to use only simple words, but have it sound good: "Still drug-dazed, Torisa stumbled to shove her bed to the ship's nose, uncovering a floor panel whose edges she gripped to raise the wheel to hand-steer the ship, while the Captain ate the pain of brain-scrub." I like that so much, that even with an unlimited vocabulary for the flagship text, the biggest change I made was to replace "dazed" with "befuddled". September 14. Lots o' links, starting with two threads from Hacker News, one about the new European internet copyright law and how terrible it is. And a discussion of the complicated causes of homelessness in Seattle. A fun reddit thread, What's the creepiest/scariest thing that you've seen but no one believes you? And a scary reddit thread about people who have fried their brains on LSD. I've done LSD a few times, and I absolutely love it, so I understand why people with a large supply are tempted to push the limits, but that's a really bad idea with a drug that can change your brain permanently. From the subreddit, Where - and how - will the children play? This is actually good news, about a movement in New Zealand to make playgrounds more fun without being too dangerous. Now we just have to do the same thing with society. It's been a while since I posted about my favorite sport, women's soccer. This one-minute video shows Sam Kerr's goals in August, and she's easily the NWSL's flashiest striker, but I agree with this article that the best all-around player is Lindsey Horan. All of the stalactites are situated above quartz eyeballs, like the cavern is dripping potions into its own dilated pupils. We'll have new design aesthetics, generating a low level of synthetic bumpiness so the real bumps don't stand out. We use this kind of aesthetic when we generate background rain/surf to mask less appealing environmental noise. The next step would be to build smart generators that incorporate the intrusive noise -- maybe create mild background thunder to mask a car door slamming in the street. As we achieve more control we'll do more design. Cars are getting quieter so we're already discussing how we want them to sound. So our first instinct is to eliminate noise, and then we re-introduce noise as art. I'm thinking of music producers who add pops and hiss, or theme park rides designed to be excitingly bumpy. Then I think the next stage is to go back toward reality. Kevin mentions this bit from Joe Rogan's Elon Musk interview, where Rogan talks about how much he loves driving his old Porsche 911. ...because it's so mechanical. The crackle, the bumps... it gives you all this feedback. I take it to the Comedy Store because, when I get there, I feel like my brain is just popping -- it's on fire. It's like a strategy for me now... I drive that car there just for the brain juice. If you're the driver, mechanical feedback is interesting because it's integrated into what you're doing. But if you're a passenger, it's meaningless. And sometimes we can decide which one we are. If I'm walking through the woods, barefoot on a rough trail, my mind has to engage with the complex surface under my feet. If I'm wearing shoes on a paved trail, I can ignore the whole foot-ground interface, and focus all my attention on looking at the trees. And if I'm in a smooth bus on a highway, I can ignore my entire environment and read a book. There's no wrong choice, but we usually make these choices without being aware of our full range of options. And in the middle ground, I imagine technologies that can give us sounds and motions generated not from the road but from the landscape, so you can feel the difference between forest and desert and city. Then it gets really weird if we have technologies that can give us feedback from beyond our human senses. September 10. This 1943 George Orwell essay is titled Why Socialists Don't Believe In Fun, but it's really about the failure of utopian fiction to create worlds that readers actually want to live in. Orwell thinks it's because happiness comes from contrast, and fictional utopias are too static. But there have been some better imaginary worlds since 1943, and you can find the best ones in comment threads like this one from Ask Reddit: If you could live in any fictional world, which one would you choose? I think the difference between boring fictional utopias, and worlds you actually want to live in, is that in the former the author is "playing not to lose", trying to create a world with nothing wrong with it, and in the latter, the author is trying to create as much good stuff as possible and not worrying too much about avoiding bad stuff. Now I'm thinking about American politics, and how Democrats have allowed Republicans to become the party of fun. But I'd rather write about technology, and I love this title: Bump-Canceling Bunk Beds Promise Supersmooth Bus Rides. It's about using quick sensors and tiny motors to cancel out bumps like noise-canceling headphones. It's a cool idea, but still, if we let supersmoothness become the new baseline, then even a tiny bump will become an annoyance. As we go down that road, we're spending more and more resources to be bothered by smaller and smaller things, and also to be more removed from reality. This reminds me of a story from a Tom Brown wilderness survival book, where young Tom asks his Apache mentor, "Why doesn't the cold bother you?" The old man pauses and answers, "Because it's real." On that subject, The Health Benefits of Being Cold. September 7. I was going to write more about bridge collapse as a metaphor for social collapse, but then my metaphor collapsed -- because when a human snaps, the people around them tend to make up for it by getting stronger, and bridge cables don't do that. A social organism has to be in pretty bad shape, before one person's mental breakdown can take down the whole thing. The other day I caught up on months of posts by smart blogger Siderea, and these are my two favorites. You Should Probably Know about Vienna is about how Vienna keeps rents low without rent control. I'm not going to summarize it because that post is already a summary of a longer article. The New Behaviorism makes two points. 1) When psychologists talk about "learning" they're usually talking about eeeeevil behaviorism. 2) Behaviorism doesn't work very well. This comes back to one of my favorite subjects: the difference between intrinsic and extrinsic motivation. In a perfect society, motivation is 100% intrinsic, and that's actually been done by some hunter-gatherer tribes -- the test is whether a culture lacks the concept of "freeloading". As we drift farther from that ideal, into a system that depends on tasks that not enough people find enjoyable for their own sake, we need to use reward and punishment as clunky patches for a broken system. If we go too far down that road, supposed experts in human psychology might not even think about actions being driven by anything other than reward and punishment. September 6. Catching up on links, the NY Times has a really good article on the Genoa bridge collapse. Basically, the bridge was designed with no redundancy, so the failure of one cable would bring the whole thing down, and then the cables were encased in concrete, which was supposed to make them resistant to corrosion, but instead it hid corrosion. Then they were sloppy with maintenance and testing. I wonder if the same kind of thing happens with social collapse, especially the part about corrosion being hidden. More doom from this Flickr vid, Temperature Anomalies by Country 1880-2017. Subtler doom from this reddit thread, What are some cliche things that people do in real life only because they've seen it done before in movies? For example, accidentally killing a guy by breaking a bottle over his head. The bigger issue is that our whole culture seems to be drifting from understanding how things really work, to making dumb mistakes because they seem cool. That has to be a normal way that people and systems are weakened by having too much power. Deeper in that thread is a discussion of what autistic people are really like, including this comment explaining that the only way they become savants, is if they become totally obsessed with something at an early age. That makes sense. Nobody gets a skill by magic -- you have to put in the time. I don't want to say put in the "work" because if you're obsessed, it doesn't feel like work, which is why obsession is so powerful. I imagine, when a society is young and strong, it emerges bottom-up from whatever people are obsessed with; and when a society is old and dying, like ours, there's almost no overlap between what people are obsessed with, and what they need to do to keep the whole thing going. A symptom of a dying society is a glorification of "hard work" that you do for virtue or status and not because you enjoy it. A long article from the Guardian, How to be human: the man who was raised by wolves. It's mostly about how much he enjoyed living in the wild, and how difficult and painful it is to live among humans. There's much more about feral kids in this mirror I made of a Fortean Times article long gone from the internet, Wild Things. September 4. From earlier this year, a smart blog post, notes on cheese. It's about cheese in the sense of art being bad because it's "cheesy". The basic idea is that you have to risk looking stupid to make good art, or even to be an interesting person. Cheese isn't the same as deliberate camp or winking meta-textuality, because those things are ironic. They don't opt out of dignity; they opt out of trying. They might be trying at something, but not, the vast majority of the time, what they're winking at. Cheese isn't cheese unless it's sincere. The final sentence mentions cheese as an attribute of whole cultures, which reminds me of an anecdote from the early 1940's. A Japanese guy was convinced that his country had such a vigorous culture that they couldn't lose a war with America. But then he saw some Hollywood musical, with forty chorus girls garishly dressed and lifting their legs in perfect unison, and he realized, a culture that could try something that ridiculous, and pull it off, was going to win the war. I'm not sure if my own fiction counts as "cheesy". I think of it as elevated trash. At its heart it's cartoonish rather than literary, but I try to make every detail brighter than the sun. 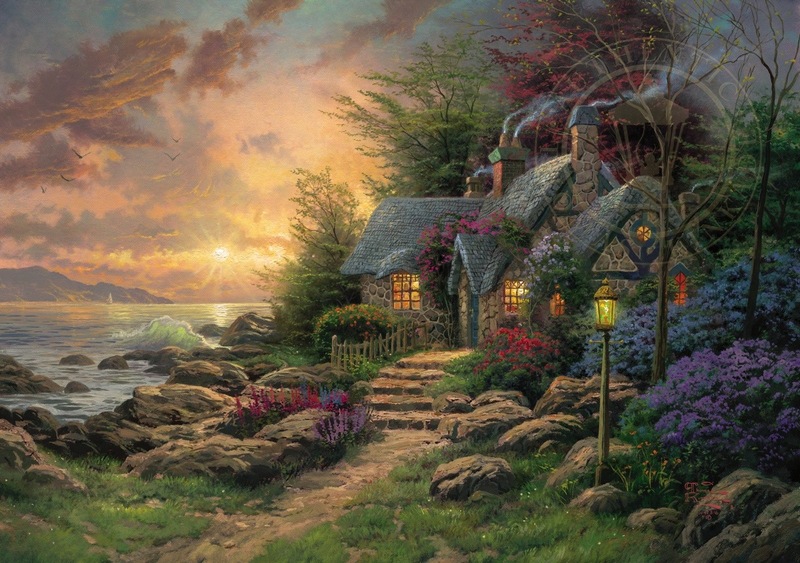 I actually admire the kitschy painter Thomas Kinkade. Even though his art lacks both darkness and weirdness, it takes both courage and skill to pack beauty so densely. August 30. Going early into the weekend, some loosely related links. Street Trees is a reddit post from Slate Star Codex, about the many benefits of street trees to health and public expenses. You could make a semantic argument that these are not "economic benefits", since the present economic model requires more and more money to circle around itself. Or, if you extrapolate the benefits of street trees far enough, nature does everything for free and we don't have an economy. A reddit thread about the worst place to live in America has this sub-thread about the shittiness of Alaskan villages, which takes a fascinating twist into dystopian space colonies. While I love space fiction, in the real world I'm more excited about biotech. Her Mother Was Neanderthal, Her Father Something Else Entirely. The stone age had several kinds of intelligent hominids running around, not unlike Lord of the Rings, and this could also happen in the future with human genetic modification. But it's more likely that we'll modify ourselves to depend on fragile technologies for survival, and go extinct. For $450, This Japanese Company Will Quit Your Job For You. I think Japan, more than any other country, is on the leading edge of humanity, and this could be a huge trend: businesses that perform difficult social tasks. August 29. Continuing on music, there's one more subreddit thread, and I want to make it clear: I'm not saying that music is getting worse. I'm saying: 1) It's really hard to argue that any piece of music is objectively better than any other. 2) I like a lot of popular music from around 1965-1985, and hardly any popular music since then. 3) A lot of my favorite music is from this century, but not popular. It is strange, if you say that 60's interior design is better than 70's interior design, nobody will argue with you, and certainly nobody will argue that interior design in all decades is exactly equally good and any apparent difference in quality is an illusion. But if you try to say that music in one decade was better, a lot of people feel bothered by that. It's probably because musical taste is more personal and varied. Yesterday I put it together, that in terms of my own taste, 2014 was one of the best years ever. It had my all time favorite album, Unlikely Mothers, and at least six more top tier songs: Nicole Dollanganger - Please Just Stay Dead, John Matthias - Pre-Loved / Vintage, Fat White Family - Touch The Leather (Redux), Doctopus - Wobbegong, Timber Timbre - Grand Canyon, and Your Friend - Bangs. August 27. There's been some good discussion of musical quality on the subreddit. From a few days ago, On the Tragic Decline of Sonic Literacy (And Quality) In Classical Music (Satire). And from yesterday, Was Beethoven a Narcissistic Hooligan? The latter links to an essay about how Bach and Mozart were making music about the universe, and then Beethoven made music about his own warped soul. Personally, I've listened widely to classical music (but not deeply) and the only thing I've heard that really excites me is Beethoven's Great Fugue. More recently, if they count as classical, I love Steve Reich's Piano Phase, and I named a character after Moondog's Torisa. Anyway, it's hard to argue that musical quality is anything but subjective. Even if you can measure objective stuff like timbral variety, you can't say for sure what's better. My own favorite song has vocals that sound terrible to almost everyone, and I'm unable to quantify the astonishing beauty that I hear. It's like everyone's brain is a lock, and different pieces of music are keys. There is broad agreement that popular music is getting worse. But that could be because music is serving a different function. Fifty years ago, it was about blowing the doors off your mind, and now either people don't want that, or they're getting it from other things, and the function of music is more about zoning out. By the way, my favorite band, Big Blood, released a new album earlier this summer, and some of the songs have appeared on YouTube. The album's centerpiece is Olamina, and my personal favorite is the much weirder Wishy Wishy I.
August 24. Stray links. New Research Suggests Evolution Might Favor Survival of the Laziest. For more ideas on this subject, check out Chris Davis's Idle Theory of Evolution. Basically, the less busy you are in normal life, the more room you have to get more busy in emergencies. Of course this also applies to the workplace. Related, The Secret to Ant Efficiency Is Idleness. The Crypto-Recession: An upcoming global economic meltdown caused by blockchain technology. Related, from 2016, Bitcoin = Death Processors. And some fun with AI (thanks Luke and Jesse). Writing with the Machine is a text autocomplete engine powered by old sci-fi stories. And Text to Image does exactly what it says. August 22. America's Invisible Pot Addicts, and the Hacker News comment thread. I agree with someone quoted in the article, that the best legalization law is what DC has: you can grow it, gift it, and use it, but not buy or sell it. But it's too late for that. Now that big money is involved, cannabis is another mass mental health crisis driven by capitalism. To be fair, it's not as bad as social media. There are two you's: high-you and sober-you, and they need to get along. Addiction is when high-you becomes a parasite draining the life of sober-you. Eventually sober-you dies and high-you dies too. Now, if I'm high-me, I want to keep getting high for another fifty years, so it's in my interest to keep sober-me alive that long. And if I'm sober-me, I need high-me to give me something back. So you have to set up a third internal person, call it a mediator or a boss, to keep high-you and sober-you working together for the good of the whole. My latest rules: 1) Never more than three days in a row. 2) For every day when I use any, there must be two days when I use none. 3) 48 hours is the worst break. 4) Don't let the doses creep up in size. 5) Don't use it just because I'm bored. 6) High-me has to do something useful, like bicycle to the store for groceries. 7) Sober-me gets to have some fun. I'm thinking about doing almost all of my music listening sober. Not only will that save my ability to appreciate music sober, but also, yesterday I was sitting by the creek with a top-notch stoner track on headphones, and I preferred to hear the ambient sounds of nature and traffic. August 20. Continuing with self-analysis: it's dangerous to say that you're bad at something, because that belief might block you from becoming better at it. I think it's possible for me to become good at all the stuff I'm bad at -- it would just take a long time, and might not be the best use of my limited self-improvement energy. I agree with Temple Grandin that it's best to focus on your strengths, to become even better at what you're already good at. Still, if your subconscious mind fails to do its job, and your conscious mind has to step in, in the long term that gives you a higher ceiling in how good you can get. I'm also wondering about deeper causes, and I think it's mostly a matter of mental focus. The mind can focus anywhere on a whole range from needle-tip narrow to whole-world wide. My mind likes to go narrow, which is why I'm good at math, and also at fine-focus physical skills like calligraphy. It takes a real effort for me to go wide, and I can't stay there for any length of time. So when I'm driving, I have to keep looking in quick sequence at one thing and then another, because it's so hard to take in everything at once. But I think adjusting our mental focus, both its width and location, is something we can practice and get better at. August 19. Fascinating article, My Life as a Psychopath. The interviewee sees psychopathy as a morally neutral alternate way of being, and argues that our perception of it has been skewed by looking at criminals, just as it would be if we looked at the criminal segment of any other kind of person. This has got me thinking about the ways I'm different from most people. I've never been to a professional, but I think I would be diagnosed either aspergers or schizoid, if not neurotypical. I can see, in action, a kind of collective subconscious that other people are tuned into, that I'm not part of. People just seem to know the right way to do things without ever being conscious of it. This includes social behavior, like bantering and touching each other, and also athletic instincts, and also a kind of mass spatial awareness. I noticed on my recent trip, that when I'm on a crowded street, it takes my full attention to not constantly bump into people, and everyone else seems to be doing it with no conscious attention at all. I'm not sure that I have what people call "body intelligence", or that I've ever had a "gut feeling". In my novel I have a brain-injured character say "I feel like the clumsy puppeteer of my own body," because that's how I've always felt. My body gets hungry, thirsty, sleepy, sometimes it wants to go for a run, but more often I have to drag it around to do stuff it doesn't want to do, and it never volunteers anything spontaneous (except restless legs syndrome). The psychopath interviewee says a few things that I can relate to, including this surprise: "Most people feel trust as an actual emotion. I never knew that." For me, trust (or lack of trust) is completely cerebral. I tend to trust people because it's simpler to assume that things are as they seem. I also find it helpful to define "love" in terms of actions rather than feelings. For my entire life, I've been getting in trouble for not showing enthusiasm -- and yet, when I actually do get enthusiastic about something, and show it, people get disturbed. This is how I personally interpret the song "You've Got to Hide Your Love Away." August 17. A few more links. Brutalist Web Design is about moving web design back to being simple and functional. There's also some good stuff in the Hacker News comment thread. A deeper issue is why almost every website adds more and more clutter, and you almost never see it go the other way. Maybe it's just that the people who make decisions about web design can't stand doing nothing. By the way, "brutalism" in architecture is not named after the English word "brutal" but after the French word for raw. Thanks Erik for this good article about how human color vision is heavily influenced by culture, starting with the evidence that ancient people didn't see blue. And some music for the weekend. I've never been much into electronic music, but this album is really creative: Autechre - Chiastic Slide. And when we were in Glasgow, we went to a great live show by a psych rock band called Helicon. This is their best song, Seraph. August 15. Some stuff from the subreddit. This post has a ton of good links: Looking for subcultural communities; the more diverse, the better. Let's ditch the dangerous idea that life is a story. I actually do think that life is a story, but I also think that the self is an illusion, and the middle of the article covers that angle. I don't see a contradiction. The person you think of as "you" is a player in a story that you can never fully understand. Finally, a comic about the feeling that life would be better after a hard crash. Maybe it's not true yet, but it's becoming closer to true all the time, as our society adds more rules that put personal safety and economic growth above all other definitions of quality of life. Or you could look at the Hindu trinity, and say that we're going more and more toward preservation, and away from creation and destruction. The pendulum has to keep swinging, and we only imagine the most extreme scenarios because they're so much simpler than what's really going to happen. August 13. I'm back in Pullman. It's great to have everything in English again, and to be on a computer where moving the cursor is not like doing surgery. I even like the smoky air from the summer fires. I want to make it clear: I'm glad I went to Europe. It was really good for me. But mostly it was a long series of challenges and ordeals. Everyone has things that they feel uncomfortable doing, and if possible, we arrange our lives so we don't have to do those things. For me, three big ones are 1) navigating social landscapes where I don't know the rules; 2) dealing with people in uniforms; and 3) spending money. I just did all of those things repeatedly for a month, and now they bother me less. But it felt more like boot camp than a holiday. If I go to Europe again, I might buy an unlimited rail pass, even if it ends up being more expensive than buying tickets individually. Because in addition to transportation, I would be buying lack of stress, where there are no consequences for missing a train, and also buying the freedom to improvise. Or I might just stay the whole time in one place. I'd also like to do a trans-Atlantic cruise, because it would be more chill and less dehumanizing than flying, and I hear some of them are really cheap. Here's a quick best of Europe list. Best beer: Campervan Leith Juice, Edinburgh. Best Asian food: Co Chu, Berlin. Best Italian food: Ristorante Rigoletto, Mettmann, Germany. Best Mexican food: Topolabamba, Glasgow. Best museum: National Museum of Scotland, Edinburgh. In that museum was the thing with the best name: the logboat of the Loch Glashan crannog. Best public parks: Maastricht, Netherlands. Best public toilets: Princes Square, Glasgow. Best travel seats: National Express buses, Scotland. Best mall: Fünf Höfe, Munich. Only drinking fountain I ever saw: Friedensplatz, Bonn. Best art collection: railroad graffiti around Düsseldorf.